Defense Minister says IDF missile defense system intercepted 27 of 30 rockets it tried to shoot down. 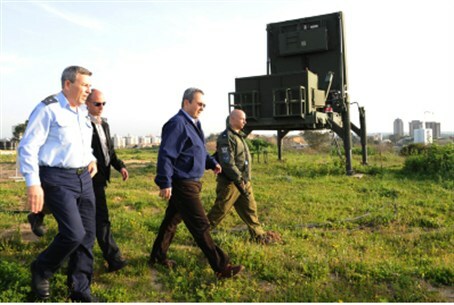 Defense Minister Ehud Barak said Saturday that the IDF's Iron Dome system carried out 30 attempted interceptions of rockets fired from Gaza since Friday, successfully shooting down 27 of them. "This is a 90% success rate – a very high percentage – and we have 13 or 14 dead in Gaza and some serious damage done to the Resistance Committees' infrastructures," he added. The IDF Website counted 31 attempted interceptions, with 28 successes, by 7:30 p.m. Saturday evening. Barak explained: "The current round began with the hit on Zuheir al-Qaisi, one of the heads of the Popular Committees, who apparently was in the process of planning a large scale terror attack that I cannot yet say has been thwarted. This turned into a round [of fighting]." Barak congratulated all those involved in Iron Dome, which proved itself to be an effective – if expensive – anti-missile defense over the weekend. "This is the time to say thank you to Iddo [Maj. Gen. Iddo Nechushtan – ed. ], the IAF Commander, who was behind the vigorous effort to complete and operationally deploy the Iron Dome batteries as they arrive, and thank you to the Aerial Defense fighters, and of course, thank you to the industries' people for the extraordinary accomplishment of Iron Dome." The Defense Minister added: "This system, which is part of the multi-layer interception system, changes not only the defense of civilians, but also the freedom of operation of the military leadership and the political tier when we deal with the threats that surround us." "I think it is time to say that this accomplishment, by Iron Dome, needs to be expanded and translated to the other layers, of Magic Wand and the two tiers of the Arrow, so that the citizens of Israel – in the Middle Eastern situation – will have the best defenses that Israeli technology and the accomplishments of our people and fighters can provide." "This is an effort that will take several years, but it is vital to enter it as soon as possible so that it ripens."